True, you have seen us put the Samsung Galaxy S II battery thought its paces before, but we thought you might be interested to see how it does over our new testing course. So here goes the Samsung Galaxy S II battery life test, revisited. The Android smartphone comes with a 1650 mAh battery and a pretty large 4.3″ screen. Judging by those specs alone, we probably shouldn’t expect the Galaxy S II to top our charts, but the power-efficient Super AMOLED Plus might help it put in a decent performance. Plus, its latest Android update is said to improve battery performance, so who knows. We were hoping the Samsung Galaxy S II would do well in our first test, 3G talk time, as it’s all about battery capacity and screen size doesn’t come into the equation. The former Samsung flagship didn’t disappoint, going on for 8:35h before it switched off. The second trial was the browsing test. We are getting lots of questions about this one so here are the exact specs of the test. We use an automated script, which reloads a page every ten seconds. There are no flash elements on the web pages, so the playing field is even. The brightness of the phones’ displays is set to 50% and we use a Wireless N connection, with the router placed a few meters away from the tested phones, so we are getting full bars on every one of them. With the predominantly white web pages not being particularly kind to the AMOLED screens, we didn’t expect miracles here, but the Galaxy S II did decently nonetheless. It survived the kind of intensive browsing that we described above for 4:24 hours, which is much better than what we saw from its bigger brother, the Galaxy Note. 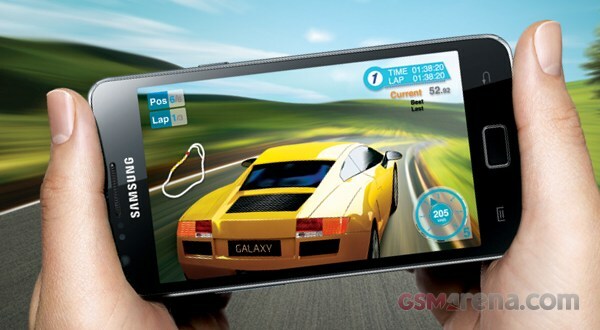 The Samsung Galaxy S II maintained its decent performance in the video playback test as well. It took exactly 8 hours of SD video playback with the screen brightness set to 50% and all radios switched off to take its battery from full to 10% (this test ends at that point). That score might rank the Samsung Galaxy S II a mere forth out of five tested smartphones, but you can see that it’s much closer to the one before it than to the one behind it. We conclude with the most important test – the overall usage benchmark. 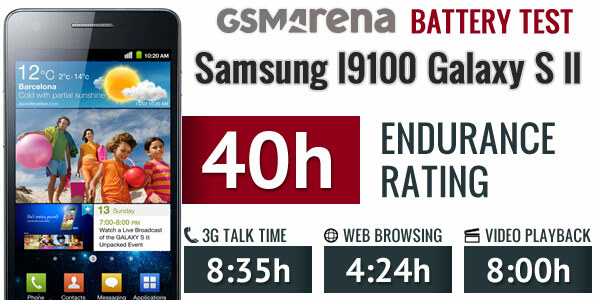 The Galaxy S II turned out quite efficient and helped it get an endurance rating of 40h. This suggests that if you’ll need to charge the smartphone every 40 hours if you do one hour of 3G calls, video playback and web browsing each per day.